By admin | November 15, 2012. 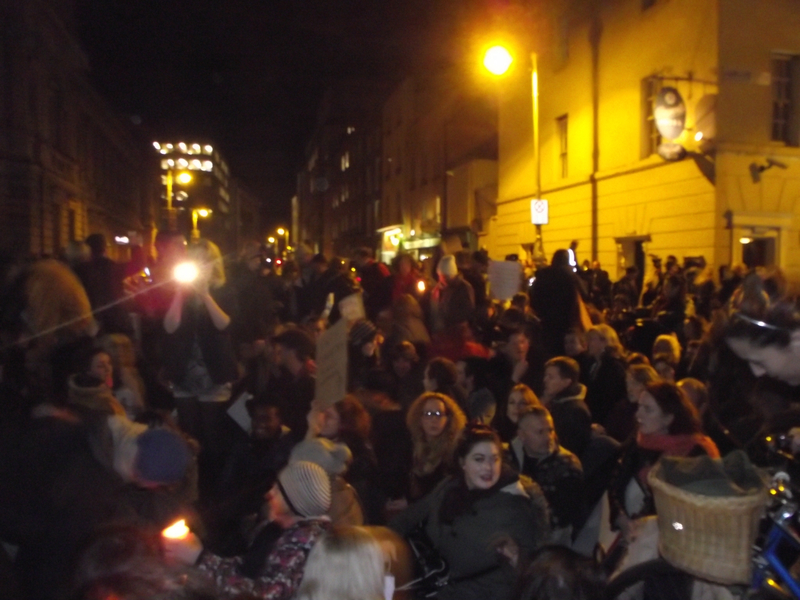 An estimated crowd of two thousand people protested outside the Dáil last night to express their anger at the tragic death of Savita Halappanavar, the Indian woman who died last month at University Hospital Galway. Central to the protest, organised by the Pro-Choice campaign, was the demand for the government to legislate for the X Case Supreme Court finding that has been ignored by successive Governments for 20 years. The protest was supported by United Left Alliance (ULA) and People Before Profit (PBP). Clare Daly TD and Senator Ivana Bacik both gave impassioned speeches calling on the Government to allow for legislation to be passed so as to prevent another such tragedy occurring again. “When we (the ULA and Clare Daly) had our legislation before the Dáil six months ago they used the cover of the expert group and even said we weren’t going far enough in the legislation,” Collins said. “I believe that if we got the legislation through the Dáil Savita might have got that life-saving treatment and the doctors would not have been fearful of giving her that life-saving treatment,” she added. Collins believes there is ample support in Dublin 8 and The Liberties area for legislating for the X Case reflecting the nationwide 83% that polls have suggested are in favour of this move. “We’ve had a bombardment of emails from people in the local area supporting this legislation and trying to put pressure on TD’s to introduce it,” she said. “We can bring our bill back into the Dáil in December once the six months since our initial attempt is up. It is terrible that tragic things have to happen but I have great faith in the people of this city and country that together we can make this change happen,” she added. “The emotion that Praveen (Savita’s husband) must be feeling must be absolutely diabolical but he did come out because he did not want this to happen to one more woman and that is what we have to carry with us into this Dáil,” said the TD. Another protest is planned for Saturday 17th November. It is hoped by many people who closed down Kildare street last night that their actions will spur the Government into some form of action.